Sawm - The Fasting during the ninth month (Ramadan) of the Hijri lunar calendar. During Ramadan, those fasting are not to eat from sun-up to sun-down. As this follows the lunar calendar, it falls at a different time during each Gregorian calendar year. Zakat - The Charity (almsgiving to the poor and needy). The standard minimum amount asked of Muslims is 2.5% of your yearly income to be given to charity. Hajj - The pilgrimage to the Kaaba in Mecca, Saudi Arabia once in a lifetime. The significance of the Kaaba for Muslims is that the Quran states that the Kaaba was built by Abraham and his son, Ishmael, as a house of worship of the one God, Allah. 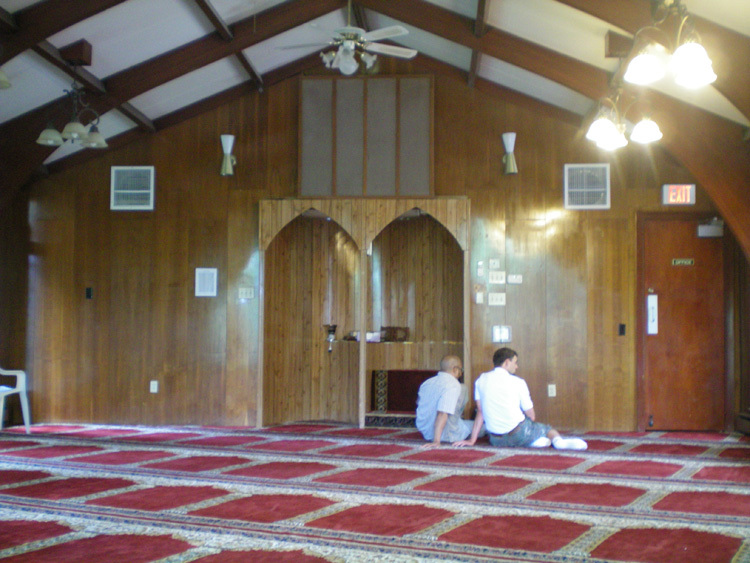 Men and women pray separately during services in the prayer hall, either in different sections or different rooms. Mosques always face towards the Kaaba in Mecca, which is the direction in which Muslims are directed to pray. Wudu area - Muslims are directed by the Quran to be clean before praying, so mosques will have an area, (usually in the bathrooms), for members to wash their hands, face, and feet before going in to pray. Shoe racks - shoes are not worn in the sanctuary, mosques will have a place, such as a shoe rack, or a rug, for people to leave their shoes before they enter the mosque. Muslims are directed to pray five times a day, and when they do, they use a prayer mat. There will usually be a section at the front reserved for whoever is leading the service as well. This mosque was finished in May of 2010, until which time prayers were held in a house owned by the congregation. 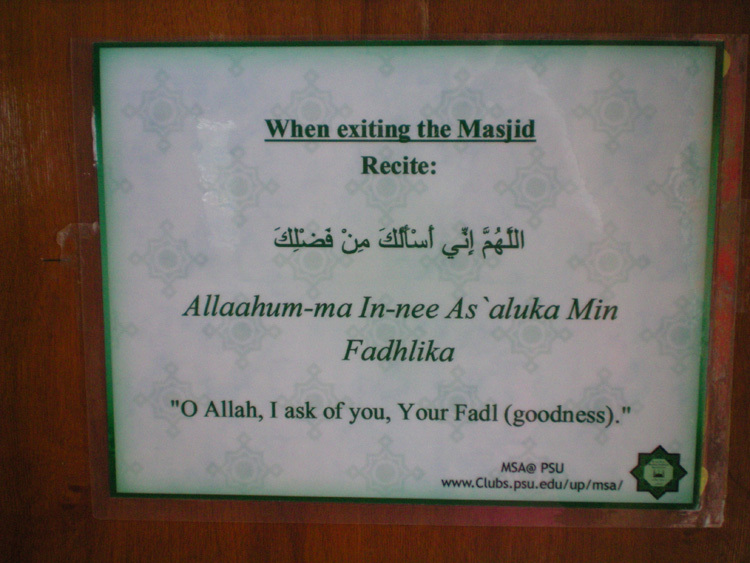 Besides holding regular prayer services, the mosque is also used regularly by the community for non-religious events. The chandeliers were imported from Italy, and the rugs were specially imported from Turkey, with the prayer mats as part of the pattern, so that members do not need to bring their own. 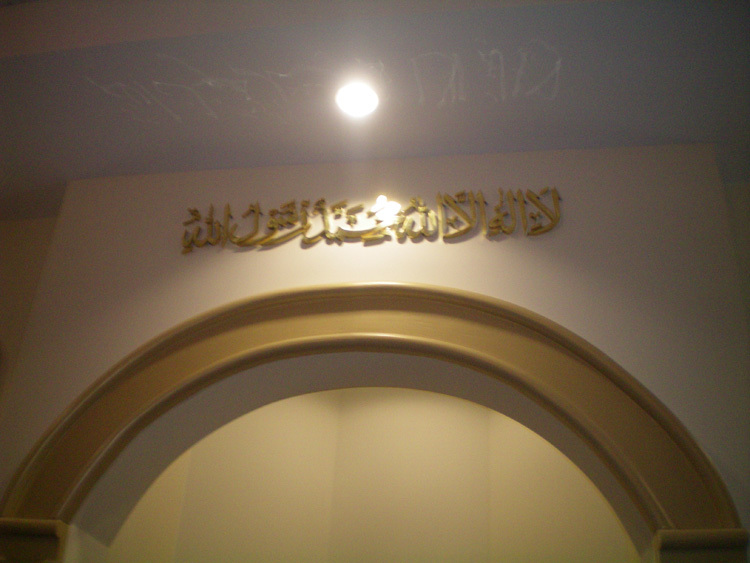 The Arabic writing at the front of the room reads "Allah is the only God, and the Prophet Muhammad is His messenger." According to Muslim faith, if anyone were to recite that sincerely, it would make them a Muslim. 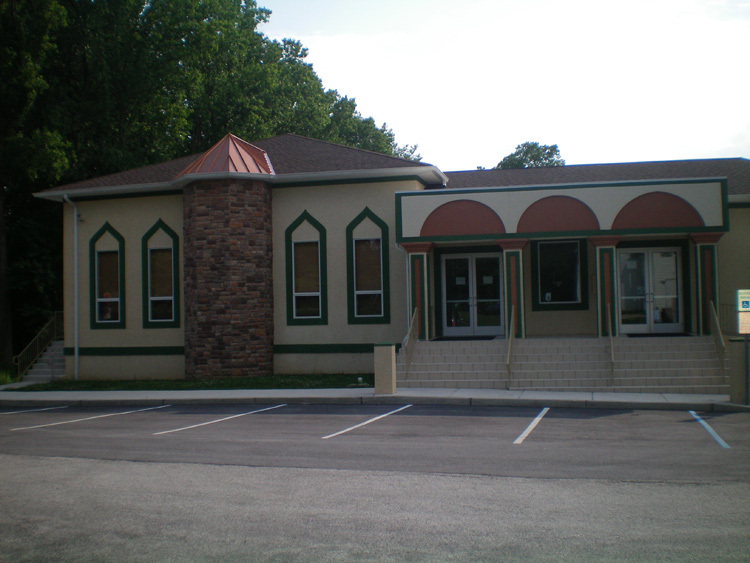 The mission of the ISGVF is to serve the religious, educational, and social needs of the local Muslim community and to promote good citizenship; to build good relations with other communities, and to assist those in need, all according to the Quran and Sunnah (the teachings of Prophet Muhammad). The community first acquired their own location for prayers in 1982, when they rented a small apartment. However, not long after that, the community had grown to such an extent that they needed more space. The current location, originally a farmhouse, was purchased and converted into a mosque in 1987. Besides regular Friday prayers and Islamic classes, the mosque also provides various outreach programs to both the Muslim and non-Muslim community and services for prison inmates. They also work with the Muslim Student Association to serve the Muslim students of Penn State University. Click the thumbnails for larger images. Photo by Rebecca Krieger unless otherwise noted. The Creed recited by Muslims: There is no god but Allah, and Muhammad is His Prophet. 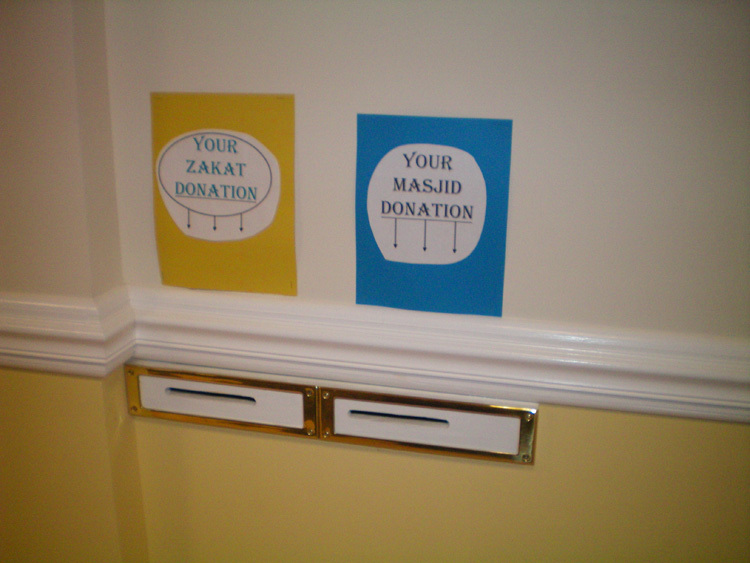 Donation areas at the Islamic Society of Greater Valley Forge in Devon. 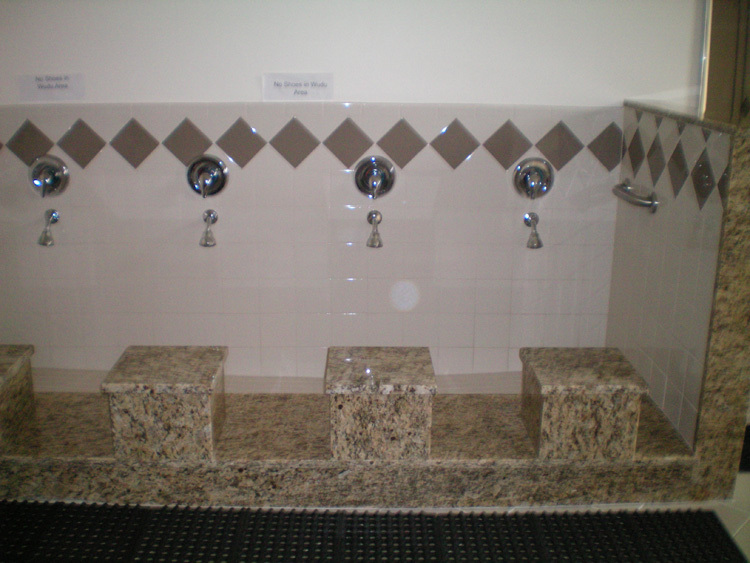 Wudu area at the Islamic Society of Greater Valley Forge. 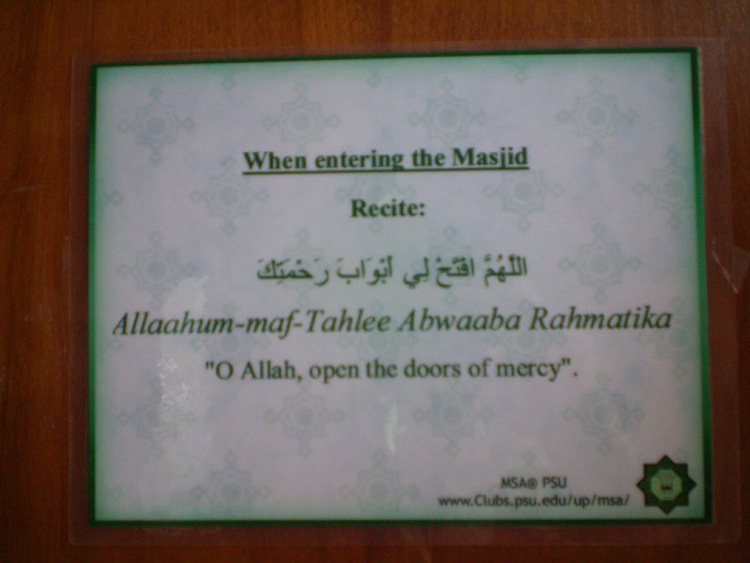 Sign on the door of the sanctuary of the Islamic Society of Central Pennsylvania in State College. 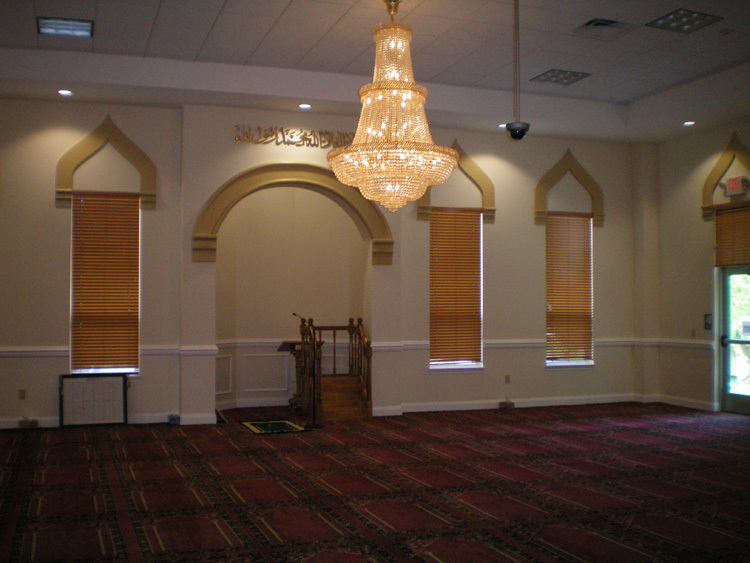 The interior of the Islamic Society of Greater Valley Forge. The carpet is designed with prayer mats as part of the pattern. 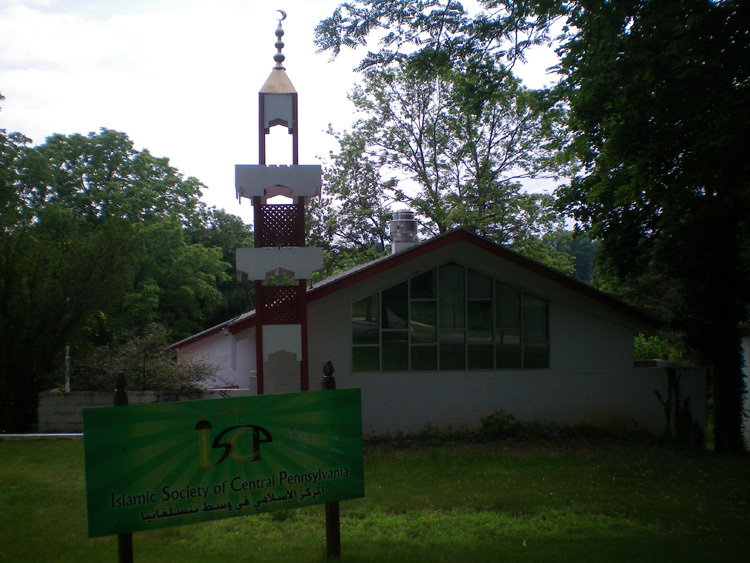 The interior of the Islamic Society of Central Pennsylvania in State College.